My name is Jennifer Vickers. I came from London, Ontario in early May to begin work as a project archivist with the Musée Héritage Museum. My job has been to digitize oral histories that were originally recorded on cassette tapes. I’ve learned a lot about St. Albert from listening to some its most important figures (including Eugene Perron, Mary Callihoo, and many, many others) talk about growing up and raising families in the area. My background is in English Literature and East Asian Studies (strange, I know, but I got a lot out of studying each subject). 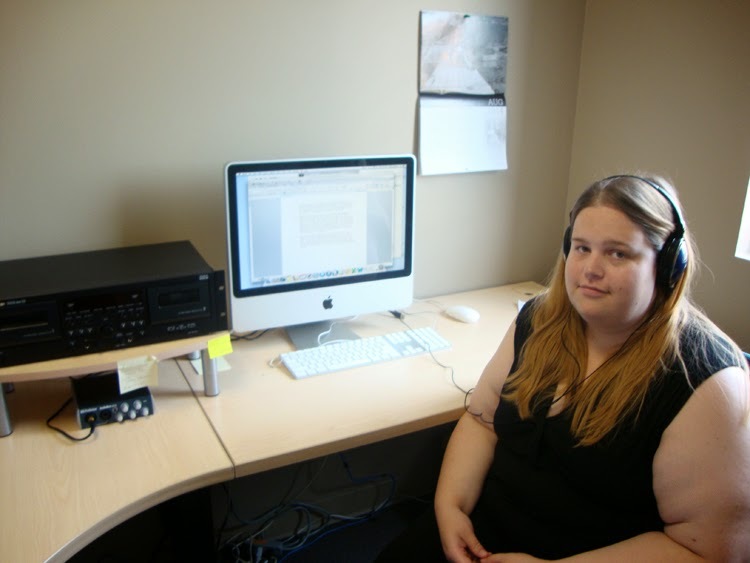 In 2013 I finished my degree in Library and Information Science with special interest in archives at the University of Western Ontario. Between then and starting my new job here in St. Albert, I worked as an intern at the Sisters of St. Joseph archives in London, Ontario. When it came time to move on, though, I found out just how difficult finding work in my field can be (especially in Ontario). Now that I’m working with the Musée I could not be happier. A typical day for me entails listening to oral history interviews while I record them onto my computer and make transcription notes. Then the recordings are cleaned up a little and stowed away until they will eventually be put online for easy access. Hopefully some of you reading this will listen to the tapes and get a better understanding of the town’s history. No two interviews are alike, either. Every single person has a different perspective on town events and culture. Fortunately I have also had to opportunity to help the programmers at the museum which gives me the chance to find out more about the community. I’ve spent time doing all sorts of crafts and activities that relate to St. Albert’s history, while working with children of all ages. The common element between all oral histories that I’ve dealt with is that they bring history to life. I’m proud that I can contribute in my small way to generating awareness for your local history and for the archives. My hope is that I can make these interviews ready for many more generations to experience. The Food Trucks Are Coming… to St. Albert!